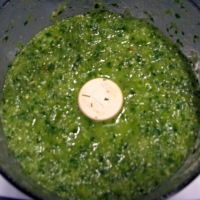 A mild salsa verde enhanced by roasting the vegetables. Remove the husks from the tomatillos and rinse under warm water to remove stickiness. Remove the stems and seeds from the chilis and cut them in half lengthwise. Roughly chop the onion and peel the garlic. Arrange the chiles or peppers, garlic, onion and fresh tomatillos on a cookie sheet or pyrex pan, drizzle with olive oil and place the pan on the topmost shelf of your oven. Roast for 15 minutes or until tomatillos are slightly browned and tender. Juice the lime and zest the rind. Put all the ingredients into a food processor or blender and pulse. Add the salt and oregano. Pulse some more until smooth and well blended. Wow Laura! This is gorgeous. I really hope I get a chance to make this some time. Poblano peppers may be a problem here in Ottawa? Tomatillos is something I have never used. This looks good. Thanks Laura. Like otterpond's recipes? Never miss an upload!